According to a Blue Cross survey, published in 2011, the UK pet products market is worth around 15 billion pounds a year. It’s clear we spend a great deal of money on our pets (and dogs make up a large portion of the pet population), and the producers are more than happy to keep up with our demand for dog related products. But with so many choices, how do we choose wisely and get the best value for money along the way? With that question in mind – and in view of the fact that I have lived alongside hundreds of combinations of different dogs in my home, using many and various toys and equipment – I thought I would create a series of posts about the truly excellent products that I have used; things that I couldn’t now be without. So what are my best doggie buys? 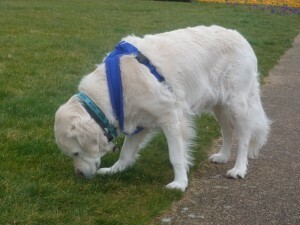 Today I’m discussing my best dog walking harness – often called a balance or two point harness. If you are unconvinced as to how a harness will help stop pulling on the lead, I’d encourage you to read this excellent blog post. Without any reservation – and having tried all kinds of other offerings – the balance or two point harness is my best dog walking harness. These harnesses provide a kind, safe way to walk any dog, and I have all the different brands and find they each have unique strengths that make them most suitable for specific dogs. The thing they all have in common is a lead attachment ring on the chest as well as between the shoulders/upper back. When used with a double ended lead, some lead work and training, this configuration can help to bring any dog into balance and teach them not to pull. The idea is that you attach one end of a lead to the chest ring, or – with the more sophisticated Mekuti harness – through the chest ring and onto one of the side rings as this video demonstrates. If your dogs is forceful and energetic and continues to pull on the double connection, you could try just using the chest ring and practice 180 degree turns if he races ahead, to train the loose lead principle. [NB the harness in this video isn’t a two point harness – it only allows the chest ring option.] Please note, that this equipment should be used as a training aid to stop pulling on the lead. The harness and the training go hand in hand. While a two point harness with double lead attachment can help you to achieve physical control over your dog, that’s not the point. The idea is to use training alongside the right equipment, until your dog learns to remain relaxed and in balance on the lead. A harness alone can only stop pulling on the lead by constraining a dog… the dog hasn’t learned anything, you have just forced him to comply. 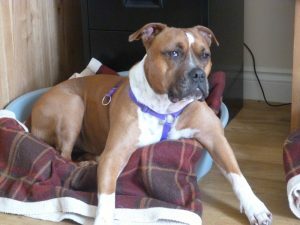 All unwanted dog behaviour requires our time and attention in terms of reward based training – the two point harness helps you show your dog the behaviour you desire. Archie in a Mekuti harness. If I could only have one harness it would be the Mekuti medium balance harness as it’s highly adjustable and extremely versatile with chest, back and (both) side rings. It has clips that open on both sides of the body, (so no “step in”) and can also be chosen with a neck clip, for dogs who are head shy. This an excellent walking-training-balance harness, with maximum attachment points (5), giving it great versatility; it’s essentially at least 4 harnesses in one. If your dog generally walks well on the lead then the Mekuti harness can be used like any ordinary single (back) point harness, to prevent exerting pressure on the neck or face. 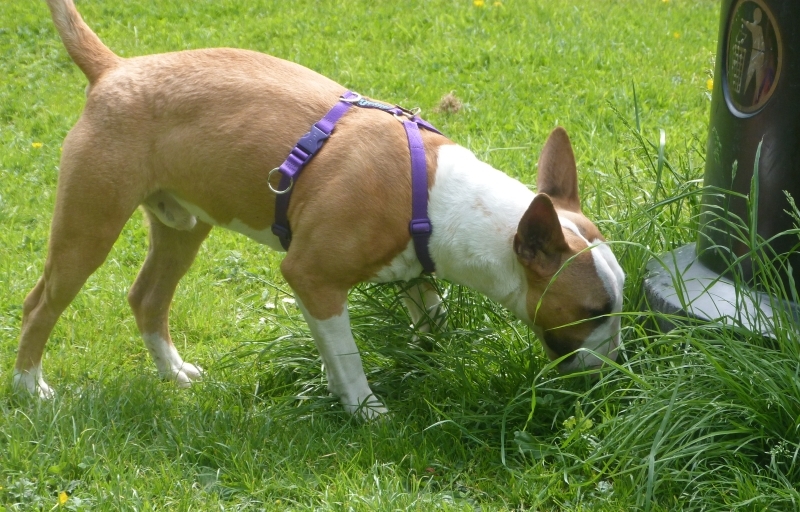 Often a non-pulling dog will still walk ahead of, rather than beside, their human, which is some situations (like a busy street or passing a reactive dog) can be a problem. The Mekuti can readily convert to the two points of contact option (chest and upper back), should a situation call for your dog to be walking close beside you. The third option is the training option – with two contact points and the lead threaded through the chest ring and onto the side ring. This gives optimum control and achieves balance for most dogs. A dog in balance can engage his brain and learn. Finally there’s the option of using the chest ring, which is great for actually showing a very boisterous dog what you are asking them for by allowing the dog a completely loose lead and then turning them back when they exert any tension on it (see video above). Because I think these harnesses are wonderful, and they aren’t readily available in the shops or big online retailers, I have committed to selling them myself and I have a number of size and colour options available, or can order them in specifically to your requirements on a try before you buy basis. I’m happy also to provide a fitting service within the Newcastle/North Tyneside area. If you are interested in purchasing one of these harnesses please contact me to discuss the best option for your dog in terms of size and whether to have a neck clip or not. Marcus modelling the Xtra Dog soft fleece training harness. The Xtra Dog harness is a very different design, as it has a wide fleece background that the webbing sits on. The neck is fixed (not adjustable in size) and it only has front and back attachment rings, however, the design is great, with the short ‘x’ crossover piece between the shoulders, and – if well fitted – is very comfortable. I like the width of the fleece for larger dogs (spreads the area of pressure across the body) and the smaller sizes are neat and can fit many breeds snugly. Less useful for any dog whose head is very large in proportion to its neck and body. I often use this design for larger dogs and I prefer it for most retrievers, huskys, dalmations, greyhounds and similar breeds, so long as I can achieve a good fit around the neck. However, I’ve used it with small terrier breeds too and it’s been ideal. It is really important with this design, to make sure that you order the right size for the neck opening in particular to be a snug fit, if you measure the dog’s neck and contact XtraDog, they will advise you. Like the Mekuti, these are excellent harnesses that aren’t readily available in the shops, so I have committed to selling them myself and I have a number of size and colour options available, or can order them in specifically to your requirements on a try before you buy basis. I’m happy also to provide a fitting service within the Newcastle/North Tyneside area. If you are interested in purchasing one of these harnesses (or any Xtra Dog product) please contact me to discuss the best option for your dog in terms of size. They come in a variety of smart colours. The T-touch balance harness is similar to the Mekuti, but without the side contact points. It comes with an opening clip on both sides of the neck as standard, though I am not sure I prefer this as it makes it less adjustable – and therefore potentially ill-fitting – around the neck because of these clips. Of course, if you are buying for one adult dog this isn’t an issue so long as you buy the correct size in the first place. Available on the Tilley Farm website. The Walk-r-Cise harness is a cheaper mass, market harness, which although similar in design, has a longer back piece (less easily balanced) and is much harder to adjust because of the webbing is thicker. I think this offers less comfort for the dog as well, because it’s a firmer thicker webbing. . It doesn’t have a neck opening option or side rings, so the lead can only be attached on the upper back and chest. However, it’s readily available in shops as well as online and is a cheaper harness – albeit with fewer training options. Really helpful YouTube training video to enhance your dog’s manners on lead.